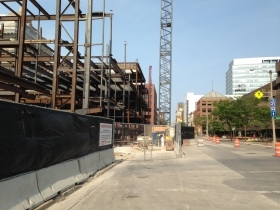 Wisconsin’s biggest office building to-be is taking shape. Workers from Gilbane Building Co. and C.G. Schmidt Inc., along with a lengthy list of sub-contractors, are at the site of the future Northwestern Mutual Tower and Commons seemingly all hours of the day. When finished, they’ll leave behind a 32-story building that contains 1.1 million square-feet of space, the biggest in the state. 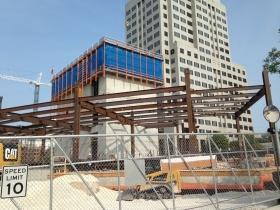 For the first time, the general public is now able to see the building taking shape. 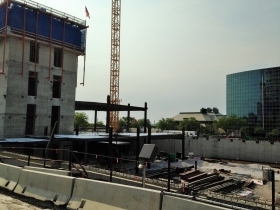 Much of the three-story “Commons” that will front Mason St. is already framed out with steel. In addition, the core of the tower is taking shape, with steel floors being built out around it. The building, designed by the Pickard Chilton firm, is scheduled for completion in 2017 with an estimated price tag of $450 million. 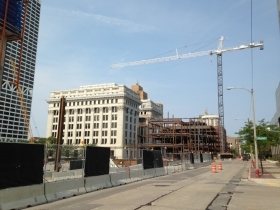 As part of their $54 million self-financed tax-incremental financing (TIF) district, Northwestern Mutual agreed to hire certified Small Business Enterprises for 25 percent of the project’s cost and city residents for 40 percent of the project’s hours, a major coup for city workers and small businesses. The city has attached another $18 million in TIF dollars to the project that will go towards public improvements within a half-mile of the project, including street repaving, Bublr Bikes stations and the redesigned intersection of N. Lincoln Memorial Dr. and E. Michigan St. The project broke ground at the end of a August last year with a ceremony that had everyone smiling. When finished, the tower will house 1,100 workers, including many from the now-demolished East Building. By 2030 the insurance giant expects to add another 1,900 jobs to their downtown campus. 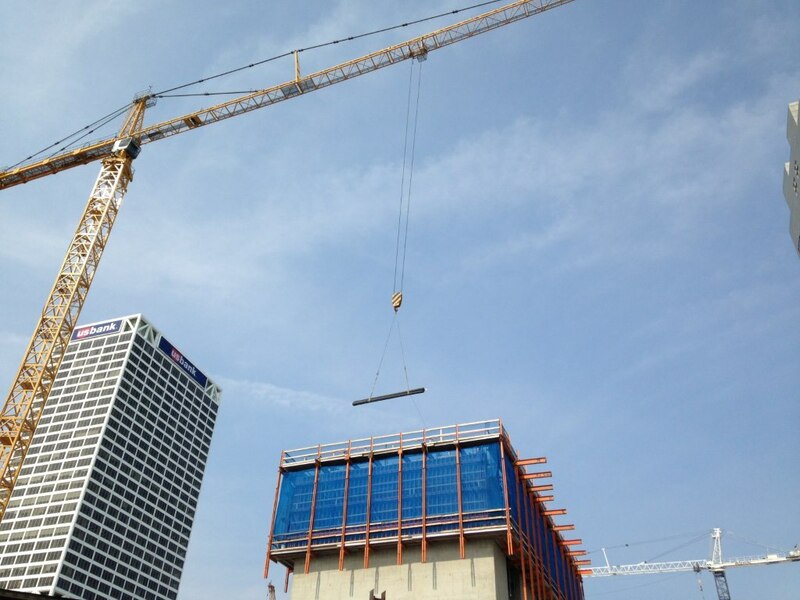 In late April the contracting team executed a 27-hour continuous concrete pour that had cement coming from Bay View, West Allis and Waukesha just to ensure smooth delivery. 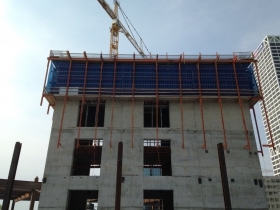 The continuous pour was required to build the foundation, and is similar in principle to the much smaller pour that happens on a single-family home. In just a few weeks, Northwestern Mutual representatives from across the country will descend on Milwaukee for the firm’s annual meeting. I suspect you’ll see plenty of them wandering around the construction. Nearby the 833 East office tower is also highly visible. You can see it from far away on N. Lincoln Memorial Dr. and Summerfest attendees certainly can’t miss it when they look at the US Bank Center. We’ve reported extensively that the “quiet company” is slowly moving to prep a block bordered by E. Wells St., N Jackson St., E. Mason St. and N. Van Buren St. for a substantial development. The company has already announced their plans to build a mixed-use building with a substantial parking component in the neighborhood, and they’ve just tipped their hand again. Sector Management Consulting Group, a long-time tenant of one of the buildings we expect NM to demolish, relocated to the Colby Abbot Building this week. NM has also demolished buildings at 795 N. Van Buren St. and 765 N. Van Buren St. Which one will the wrecking ball take down next? Can’t get enough coverage of the project? Take a look at our building page for the massive building. It’s loaded with time-lapse videos, more photos, renderings, additional articles and more. Jeramey Jannene, It would make an interesting article to compare North Western Mutual new 450 million dollar downtown building and surrounding projects with the out of town billionaire’s proposed new arena project in terms of; tax incremental financing, percentage of jobs to city residents, city and state involvement and spurring new development. Also, it would be interesting to know if the NWM downtown building developments are a magnet in the out of town billionaires supposedly upper hand in negotiations to stay in Milwaukee. Given the fact Milwaukee political leadership have proven time and time again they have no “Growth Leadership Vision” in keeping pace with other cities in the nation similar in size and geo-location e.g. Minneapolis and Chicago. These billionaires may view Milwaukee and the State, as EASY PICKINGS willing to giveaway away promising prime downtown land and taxpayer giveaways financing. Studying mention, and not mention comparisons might reveal hidden motivation by the new Bucks owners gamble purchasing a third-rate NBA team. More than likely another team in the NBA will relocate to a booming city like Milwaukee, to take advantage of the vacuum if the Bucks leave. tony M. while I may agree with most of your comment, in what world is Chicago the “same size” as Milwaukee? Chicago’s metro area is bigger in population than the entire state of Wisconsin. Minneapolis is a fair compairson, Chicago certainly is not!